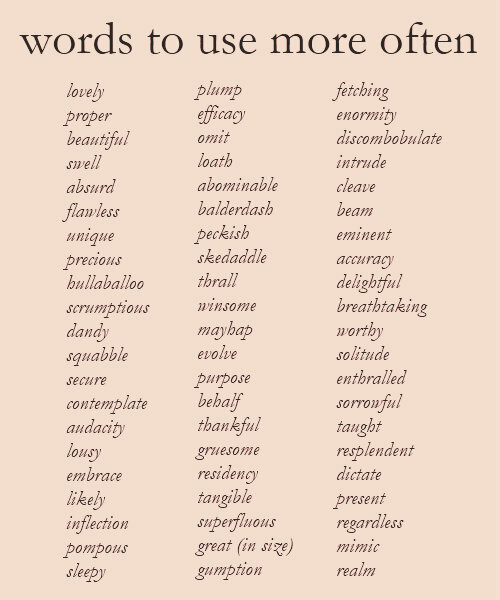 The Countless Joys Of Expanding Your Vocabulary! An expanding vocabulary is so integral to a life that is growing, but so often overlooked in our modern world!When I was a kid- and admittedly a weird kid- I would wait for the New York Times magazine to arrive late on a Sunday and flip open to William Safire’s column “On Language.” The endless array of witty entries were woven with very precisely picked, but little-known words. I would sit with a dictionary and figure out what he was saying week after week. I loved to write fiction at a young age, but without enough words, things sounded general and didn’t express what I felt. Words, in a sense, were like candy for me. My love of language was a crucial part of my childhood; it opened the doors from my suburban small town to a much bigger world. Now it seems that so many of those words I learned from the New York Times magazine are crammed in the back of my memory banks, almost unrecognizable. Recently I felt dull when I sat to write out a short piece of fiction because I am presently overloaded with generic phrases and garbled daily speech that doesn’t do too much to ignite a blank page. I realized that like a painter needs paint, a photographer needs a camera, and all of us- writers or not- need lots of words to keep life interesting. Expanding your vocabulary will help you to express yourself more fully. You don’t feel “good” or “great” right now because those are sort of general words. You probably feel about 600 other things at this very moment but the words to describe them correctly evade you, and me too! More words will bring more nuance to your imagination and your art, even if you aren’t a writer. If you want to have your verbal mind blown, watch a brilliant performance artist or a painter being interviewed. When you can distill the impossible to describe- the sensations and impulses and intentions of art- and attempt to describe them you best have intense amounts of words to select from at your disposal! Bigger vocabularies tend to correlate with bigger salaries. In fact, in 2006 Forbes published an article that detailed a pretty sharp correlation between our vocabulary and the jobs we have an the level we rise to in those positions. CEO’s, overall, had the highest scores on vocabulary tests according to the studies they reported. I am not surprised, are you? Words teach us so much about history and our human evolution, as well. Etymology– the study of the history and full meaning of words- will leave you spellbound and speechless. For instance, ever wonder how Manhattan got to be known at the Big Apple? So, for greater creativity, greater earning power, greater self-expression, greater knowledge of the world and even greater self-esteem, expand your vocabulary! – Read!!! Read more and look up- rather than breezing past- words you don’t know. HERE are great online resources to look up words easily. – Get an app for your smart-phone or tablet that sends you a word each day to learn. Or, log in to Vocabulary.com and start leaning now! – Play word games like Scrabble & do crossword puzzles. 2. Use new words you learn immediately. Don’t neglect this step or you’ll be spinning your wheels without success. Use them in a sentence, in an email, call someone and teach them the word, explain to a friend over coffee all that you’ve learned. Learning studies have proven that most of us only retain 10% of what we learn if we simply learn it once and walk away. You stand to retain up to 90% of what you learn if you use it right away or teach it to someone else, so its worth using what you know and spreading the dictionary’s wealth! At 14 my favorite word was “burgeoning”… another way to say “flourishing.” I still love that word. What about you? Do you have a favorite word? Thanks for the links, Dana!! wordsmith.org has daily subscription “a word a day” which is really great.. Yes! When I was in high school (in NJ too!) I loved the word ‘loquacious’ (talkative). The funny thing was- I was anything BUT loquacious, but I loved it anyway. I forgot all about that until reading this post! Next post: Face Your Fear & Live Your Dreams!